Quick Release Heavy Duty Plate Carrier designed to fit larger front & back armor plates up to 11" X 14" in size. MOLLE webbing for the ultimate in custom configuration. Quick Release strap will allow the Plate Carrier to separate into 4 separate panel pieces in case of an emergency that require the quick removal of the plate carrier from the wearer. MOLLE webbing on the front, back, and side panels allows the attachments of MOLLE accessories like holsters, mag pouches, utility pouches, and other essential gear. Adjustable for length cummerbund with MOLLE webbing, cummerbund can be extended out to 51"L. Side pockets will allow for 6" X 8" side armor panels/plates. Hook and Loop fasteners on the ends of the cummerbund to secure with the front panel hook and loop fasteners, for a secure fit. Adjustable for length Shoulder straps with large heavy duty quick connect buckles and with hook and loop fasteners. Includes two padded shoulder covers with MOLLE webbing, hook and loop fasteners, and loops for communications cabling routing. Top three MOLLE webbing rows on the front and back panels have loop fasteners for attaching (hook) Unit, ID, and name tapes to the front and rear panels. Heavy Duty drag handle on the top of the rear panel. 10"X 6" front pocket with hook and loop enclosure. 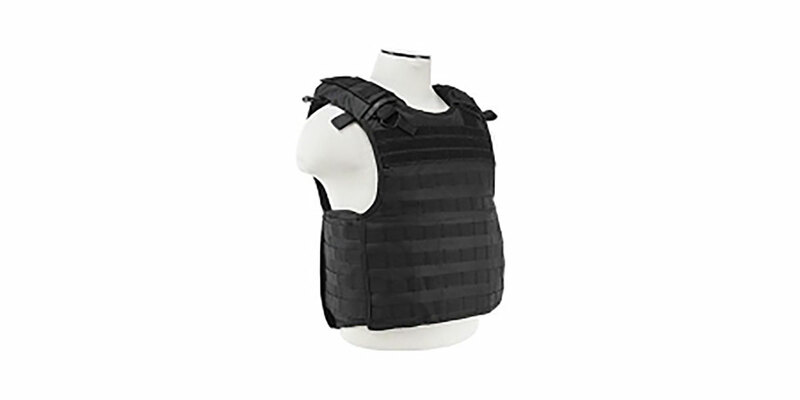 Breathable mesh inner panels with separate internal pockets for soft body armor panels and hard plate armor. Made with tough and durable PVC material that is water and chemical resistant. Double and re-enforcement cross stitching in critical areas.